The Environmental Control System (ECS) is the system responsible for performing a great number of tasks, including pressurizing and ventilating the cabin, controlling the pressure and temperature onboard, etc. 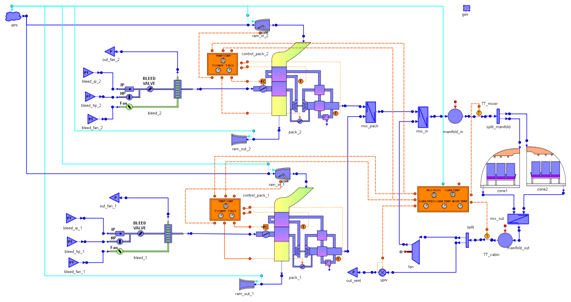 The ECS toolkit allows carrying out performance analysis and dynamic simulation of the Environmental Control System and other pneumatic systems of the aircraft. The different sub-systems like the air cooling unit, the bleed system or control systems can be quickly modeled and simulated. The user can easily customize the cabin model, in terms both of number of zones and nodes as well as the distribution of passengers in the cabin. ECS in combination with ECLSS toolkit could also be used for simulating different treatment processes of recirculated air in order to reduce the amount of fresh air required. The multidisciplinary capabilities of EcosimPro/PROOSIS and the ECS toolkits allow performing, when necessary, complex simulations of the ECS model coupled with other systems, like the aircraft engine, electrical system, etc. For example, thermal management assessment can be performed by including in the model the fuel and oil system interacting through heat exchangers. This user case studies how the Environmental Control System of a commercial airplane evolves during a controlled descent of the aircraft.